Check out the HOT new “all about you” Imagine More Success podcast with golden business and life nuggets to enhance your skills, fix current issues and manage new phases of your business! 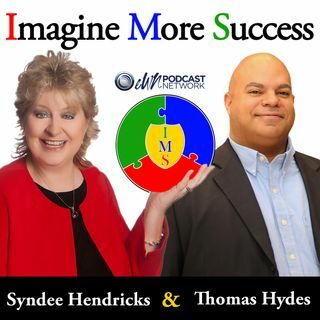 Co-hosts and best-selling Authors, Syndee Hendricks and Thomas Hyde will bring you juicy business take-aways, positive tactics and strategies to Imagine More Success and get it too! Syndee is an award-winning entrepreneur, philanthropist, Business Performance Specialist, Intuitive Consultant & Coach and ... See More Speaker. Thomas is a Certified World Class Speaker, Voice Trainer and Classically Trained Opera Singer. This is the “A-Team” for entrepreneurs, professionals, and business owners ready to leap to greater heights in business and life!